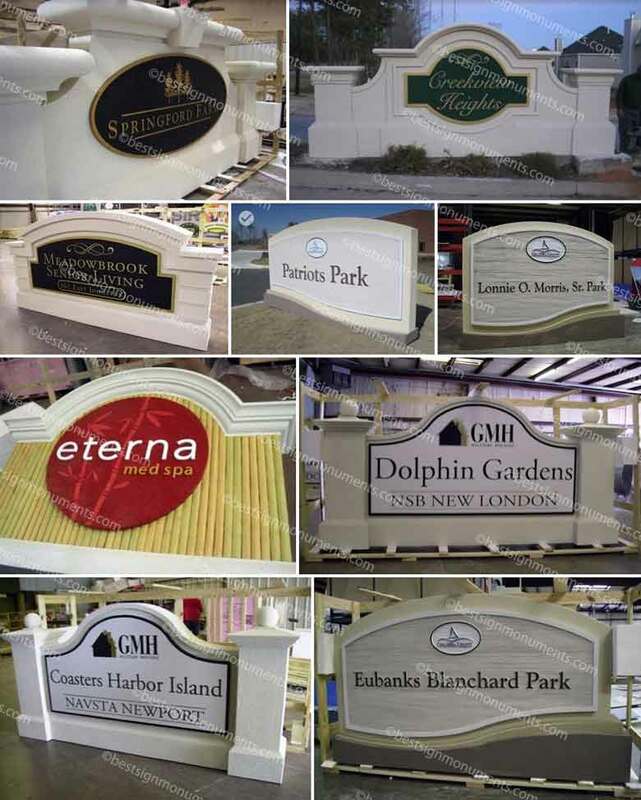 Our company is a collection of the finest sign artists in the industry. Our team includes artisans from every specialty area involved in the design and production of dimensional signage. The following photography collage includes examples of custom sign projects our team has produced over the years. We have sign examples including a vast variety of materials, for every industry imaginable, and for clients across the nation. You are currently visiting Sign Gallery Collage Number 08. Please check out the other sign collage pages by selecting a collage number above. See something you like? When completing the Online Contact Form, let us know in the Comments section! Be sure to reference any examples by collage number and the sign project name. All of our projects are custom designed and made to order. We can match any color scheme by paint manufacturer batch code, and match any existing masonry on your property by digital photograph. Our signage solutions are designed to match your needs. We are more cost-effective than hiring a local contractor for the monument, a local mason (if your monument has faux masonry), a sign shop for the graphics, and an electrician (if your project has lighting).